DYUTI (Development Yearnings for a United and Transformed India) is a yearly conference series organized by the Rajagiri College of Social Sciences to deliberate onthe vital issues of development from a rights perspective. The 17 th edition of the conference, themed "Healthy Ageing and Mental Health" was inaugurated by A. Jayakumar (Secretary General, Vijnana Bharati) on Wednesday. 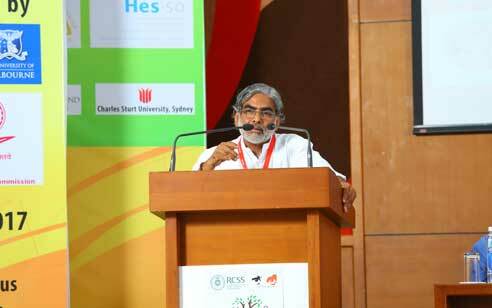 Dr. Jose Cletus Plackal CMI, (Provincial and Manager Rajagiri Institutions) presided over the function. The society forces an old person to live like an island, says A. Jayakumar. The problem of loneliness and isolation is the gift of modern society. There is a shift in the social conception of old age. Earlier, the society offered a space of respect to the old. The aged were the repositories, transmitters, and sole authorities of wisdom and knowledge in the society. Hence, today, they are pushed to the fringes of the society and given lesser attention and so the issues faced by them. It is time to take a bold step to revert the ill practices of the society, forcing the elderly to be in the shackles of isolation and redundancy. “This liberation of the aged is possible, only when the new generation is equally aware about the contributions of the elderly for them. Academic exercise of this sort are venues to realize such realities around us”, he stated. DYUTI has attracted people from across the globe who are committed for the well- being of elderly in various capacities as researchers, scholars, academicians, practioners, policy makers and so forth.There are delegates from 18 countries and 19 states of India, attending the conference.This conference is jointly organized by Rajagiri College of Social Science, University of Melbourne and University of York.Experts in the field of Geriatric care, namely Dr. K. Sekar, (Registrar, NIMHANS) and Dr. Philip Laird(Vice Provost,Trinity Western University, Canada) spoke on the occasion. Rev. Fr. Jose Alex CMI (Director, RajagiriInstitutions), Dr. Joseph I. Injodey(Executive Director), Dr. Binoy Joseph (Principal)and Dr. Anish. K.R. (HoD, School of Social Work) were present at the Inaugural ceremony of the conference.